A defining condition of being human is that we have to understand the meaning of our experience. Most of us go through life viewing our experiences as isolated, unrelated events. We also view these happenings simply as the experiences they are, not as opportunities for learning. Psychologists refer to this type of lifeview as an "episodic grasp of reality" (Feuerstein, Rand, Hoffman, & Miller, 1980), and it is not a habit we want to pass along to children. Instead, we want students to get into the habit of linking and constructing meaning from their experiences. Such work requires reflection. Reflection has many facets. For example, reflecting on work enhances its meaning. Reflecting on experiences encourages insight and complex learning. We foster our own growth when we control our learning, so some reflection is best done alone. Reflection is also enhanced, however, when we ponder our learning with others. Reflection involves linking a current experience to previous learnings (a process called scaffolding). Reflection also involves drawing forth cognitive and emotional information from several sources: visual, auditory, kinesthetic, and tactile. To reflect, we must act upon and process the information, synthesizing and evaluating the data. In the end, reflecting also means applying what we've learned to contexts beyond the original situations in which we learned something. Teachers who promote reflective classrooms ensure that students are fully engaged in the process of making meaning. They organize instruction so that students are the producers, not just the consumers, of knowledge. To best guide children in the habits of reflection, these teachers approach their role as that of "facilitator of meaning making." In the role of facilitator, the teacher acts as an intermediary between the learner and the learning, guiding each student to approach the learning activity in a strategic way. The teacher helps each student monitor individual progress, construct meaning from the content learned and from the process of learning it, and apply the learnings to other contexts and settings. Learning becomes a continual process of engaging the mind that transforms the mind. Unfortunately, educators don't often ask students to reflect on their learning. Thus, when students are asked to reflect on an assignment, they are caught in a dilemma: "What am I supposed to do? How do I 'reflect'? I've already completed this assignment! Why do I have to think about it anymore?" In response to our questions, students who are inexperienced with reflection offer simple answers such as "This was an easy assignment!" or "I really enjoyed doing this assignment." If we want students to get in the habit of reflecting deeply on their work—and if we want them to use Habits of Mind such as applying past knowledge to new situations, thinking about thinking (metacognition), and remaining open to continuous learning—we must teach them strategies to derive rich meaning from their experiences. Most classrooms can be categorized in one of two ways: active and a bit noisy, with students engaged in hands-on work; or teacher oriented, with students paying attention to a presentation or quietly working on individual tasks. Each of these teaching environments sets a tone and an expectation. For example, when students work actively in groups, we ask them to use their "six-inch" voices. When we ask them to attend to the teacher, we also request that they turn their "eyes front." When they work individually at their desks, we ask them not to bother other learners. Teachers must signal a shift in tone when they ask students to reflect on their learning. Reflective teachers help students understand that the students will now look back rather than move forward. They will take a break from what they have been doing, step away from their work, and ask themselves, "What have I (or we) learned from doing this activity?" Some teachers use music to signal the change in thinking. Others ask for silent thinking before students write about a lesson, an assignment, or other classroom task. In the reflective classroom, teachers invite students to make meaning from their experiences overtly in written and oral form. They take the time to invite students to reflect on their learnings, to compare intended with actual outcomes, to evaluate their metacognitive strategies, to analyze and draw causal relationships, and to synthesize meanings and apply their learnings to new and novel situations. Students know they will not "fail" or make a "mistake," as those terms are generally defined. Instead, reflective students know they can produce personal insight and learn from all their experiences. To be reflective means to mentally wander through where we have been and to try to make some sense out of it. Most classrooms are oriented more to the present and the future than to the past. Such an orientation means that students (and teachers) find it easier to discard what has happened and to move on without taking stock of the seemingly isolated experiences of the past. Teachers use many strategies to guide students through a period of reflection. We offer several here: discussions, interviews, questioning, and logs and journals. Sometimes, encouraging reflection is as simple as inviting students to think about their thinking. Students realize meaning making is an important goal when reflection becomes the topic of discussion. For example, conduct discussions about students' problem-solving processes. Invite students to share their metacognition, reveal their intentions, detail their strategies for solving a problem, describe their mental maps for monitoring their problem-solving process, and reflect on the strategy to determine its adequacy. During these kinds of rich discussions, students learn how to listen to and explore the implications of each other's metacognitive strategies. The kind of listening required during such discussions also builds the Habits of Mind related to empathy, flexibility, and persistence. Interviews are another way to lead students to share reflections about their learning and their growth in the Habits of Mind. A teacher can interview a student, or students can interview classmates. Set aside time at the end of a learning sequence—a lesson, a unit, a school day, or a school year—to question each other about what has been learned. Guide students to look for ways they can apply their learnings to future settings. Interviews also provide teachers and students with opportunities to model and practice a variety of habits: listening with understanding and empathy, thinking and communicating with clarity and precision, and questioning and posing problems. 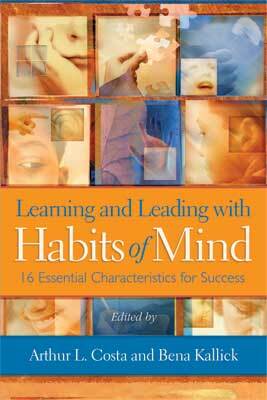 As you reflect on this semester's work, which of the Habits of Mind were you most aware of in your own learnings? What metacognitive strategies did you use to monitor your performance of the Habits of Mind? Which Habit of Mind will you focus on as you begin our next project? What insights have you gained as a result of employing these Habits of Mind? As you think about your future, how might these Habits of Mind be used as a guide in your life? Logs and journals are another tool for student reflection. Periodically ask students to reread their journals, comparing what they knew at the beginning of a learning sequence with what they know now. Ask them to select significant learnings, envision how they could apply these learnings to future situations, and commit to an action plan to consciously modify their behaviors. Students need to encounter reflective role models. Many teachers find such models in novels in which the characters take a reflective stance as they consider their actions. A variety of novels and films use the design element of reflection as the way to tell a story. For example, in Marcel Proust's Swann's Way, the main character is affected by the smell of a "petite madeleine" that reminds him of his past. Proust uses this device to dig into the character's past. In Mem Fox's Wilfrid Gordon McDonald Partridge, Wilfrid discovers that life's meaning can come from the retrieval of powerful memories. The memories truly are given meaning, however, through making them explicit to someone else. Reflecting on the day, I am still mad at myself for not listening more closely to your needs for the afternoon session. I wanted to share some of my thoughts with you. First, I find that I can use the Habits of Mind as one lens for reflection. As I reconsidered yesterday, there were four habits that I focused on: listening with understanding and empathy, thinking flexibly, managing impulsivity, and remaining open to continuous learning. Listening with understanding and empathy. One of the strengths in my work is my capacity to stay immersed in the work of others. I need to be able to listen to the surface text of the work, pay attention to the subtext of the individual (the context of the classroom, the personality of the teacher, the intentions and values that are expressed as the person presents the work), and make certain that my comments and critique are in tune with the person who I hope will be able to make use of them. I felt that our group was tuned to the work that was presented and that I was able to model that level of listening. As a result, I think that the presenters were able to listen to their own work more deeply. The other half of my listening, however, was not as attuned. Patricia tried to suggest that we make time for you to share your own work in the afternoon, but because I lunched with Michelle and was involved with some of the issues and problems she was working on, I lost some of my perspective on where the group was. As a result, I jumped in with the plan to look at the possibility for "brand x" rubrics. Although I cast the afternoon for the possibility of your working on your own rubrics, I observed that almost everyone either worked on the general rubric (with energy and commitment) or started to do their own work for the classroom. I thought that most people were using the time productively, and so I did not listen carefully to Patricia's concerns. I should have lunched with Patricia and David, talked through what was in my head for the afternoon, and listened at that time for their read of the group and its needs. Thinking flexibly. I always pride myself on the degree to which I am willing to shift plans and respond to the group's immediate needs. That strength, however, can also become a weakness—and I think that happened yesterday. When Dan suggested that we move to developing outcomes that would work across the disciplines, I immediately went there without checking with the group. Maybe that happened because the question is of intellectual interest to me right now and I also wanted to work on it. I have been struggling with how to develop a rubric that would be sufficiently rigorous and, at the same time, descriptive enough to provide a set of criteria for students that would show them what was expected regardless of subject. Clear criteria would address a question such as "Why do we need to write properly if I am in a science class?" To me, these criteria are a significant part of building a learning culture. I was exploring using the criteria in relation to the Habits of Mind—I will develop this thought more fully in a moment. Managing impulsivity. Well, this is where the habits intersect and sometimes feel contradictory. I moved very quickly with Dan's suggestion. I would say that I did not manage my impulsivity. Can you be both flexible and manage your impulsivity at the same time? I think the way to do that is to check your moves. I should have done so with the group instead of assuming I knew where to go. Had I managed my impulsive act through a quick check on the afternoon agenda, we might have gone down the same path, or a different one, and at least made the decision together. Remaining open to continuous learning. I started thinking about Evonne Goolagong. (She's a really great tennis player. What I always admired about her was her grace, agility, and enormous flexibility. She had all the strokes, and often what got in her way of winning was that she did not make the right choice of stroke for the occasion.) I think I am at a point in my career where I have many choices in my repertoire for each teaching situation. Sometimes I do not take the time to think through which is the right choice for the occasion. I am finding it easy to excuse impulsive behavior by thinking of it as flexible behavior. Because I am an "in the moment" teacher, I need to pay attention to this more than I have been recently. I am grateful to you yesterday for reminding me of the importance of this dynamic in order for me to continue to be the teacher I imagine I would like to be! After this particular reflection, Kallick worked with the teachers to design their next session to better meet everyone's needs. Sharing parts of the reflection brought them to another level of understanding as they worked together in a learning community. Reflection can bring the same spirit of community to your classroom, too. I want to be more patient. I also feel I talk a lot and don't mean to. I want to try to listen with understanding and empathy. I learned the value of our pride. In my opinion, those who were forced to serve without pay were not slaves. They were captives to slaves of greed. Now that I have this strengthened knowledge, I must apply it to my life. But the success of that assignment can only be judged by me. Only I know what is happiness and beauty in this mind and it will take me an entire lifetime to apply what I have learned to my existence. The work of educators at Croton Elementary School in Croton-on-Hudson, New York, shows how the quality of students' reflections changes as children develop their reading and writing skills. When kindergartners were asked to reflect orally, they gave rich descriptions of their work. But as they developed their writing ability and were encouraged to write their own reflections, the reflections became less descriptive. This change puzzled the teachers until they realized that students are more concerned about spelling, punctuation, and other aspects of editing when they first learn to write. Because students do not have a great deal of fluency with their writing, they are more limited in what they describe. In contrast, when meeting with the teacher, the kindergartners elaborated on what they wrote about their work. And once students became more fluent with their writing skills, they were able to represent their reflective thoughts more easily. Initially the students at Croton Elementary often offered stereotypical comments such as "This was fun!" or "I chose this piece of work because it is my best." Teachers realized that they needed to spend time teaching students how to reflect. They asked students, "What does a reflection look like when it really tells you something about the experience?" After considerable discussion—and after considering models of reflection from students and published authors—the students began to understand what was called for. Reflection was not a time for testimonials about how good or bad the experience was. Instead, reflection was the time to consider what was learned from the experience. Reflection was a time to describe what students saw in their own work that changed, needed to change, or might need to be described so another person might understand its meaning. I would add to the picture. I would add what is missing. I would be more careful. I would pay attention to conventions. I would stay to the subject. Shows interest (what student really loves). Pays attention to what letters spell. Wants papers to have a neat appearance. Talks about what was liked in drawing. Shows development of an idea. Relates to content of story (how student feels about the content of what was written). Responds in depth to dictation. Starts to write by self. Talks about genre or type of writing. Attends to style (uses dialogue). Describes well enough for a reader to picture what was written. Does not drag writing out. To help students become more aware of their writing—what makes writing work and what does not. To help students take more responsibility for their writing—to know that writing must be understood by an audience and to learn how to anticipate a reader's response through self-evaluation. To see growth in writing over the school year and to be able to talk about that growth with students' parents. Teachers emphasized to students that the purpose of reflection was not to develop a carefully crafted piece of writing, but to develop the capacity for metacognition. Here is one example from my writing to show you what I mean. Students may prefer simply to describe what is going on in the writing in their own way. When students set their goals, they will use their reflections as a basis for directing their learning journey. Students might collect work throughout the year as part of a portfolio process. Every quarter they can review the work in their collection folders and choose one or two pieces to enter into their portfolio. When they make those choices, they can take the opportunity to reflect on the reasons for their choices and to set goals for their next quarter's work. The ultimate intent of teaching reflection is to get students into the habit of reflecting on their own actions and constructing meaning from those experiences. When they develop the Habits of Mind related to reflection, they will hear both an internal and an external voice of reflection. Write a letter to themselves detailing what they learned from an experience. Send themselves a letter of advice, reminding themselves of what to look out for the next time they do something. Make a list of connections they see between their work and others' work. Include peers' work along with work that has been studied in the classroom. Record the steps they go through to solve a problem. Guide them to comment on how useful those steps were. Sit in a circle. Ask each person to share one reflection on the day's activities. Organize small-group reflections in which students share their thoughts. Then ask a reporter to present those thoughts to the whole class. Invite students to share problem-solving strategies. Ask them to focus on how many different ways they can effectively solve a problem. Ask students to share at least one example in which they observed their group using the Habits of Mind. During these classroom experiences, teachers have an opportunity to model the Habits of Mind themselves. They can show evidence of good listening skills, probe for clarity and understanding, ask thoughtful questions, and share metacognitive thinking. Through experience and continuous modeling, the class begins to learn how to use the Habits of Mind in reflective conversations, which strengthens the transfer to the internal voice of reflection. Many teachers document reflective conversations as a way of assessing progress with the Habits of Mind. For example, as mentioned in Chapter 11, some teachers create a notebook tabbed with each student's name. They also keep sticky labels close at hand. When a student makes a significant comment that shows evidence of using a Habit of Mind, the teacher jots down the key words from the comment on a label and sticks the label on the tabbed page for that student. This record provides a rich source of information for a conference or a student report. You might also consider reading student journals and noting how student reflections are developing. Keep a record for each student with notes about whether the student has moved from superficial to in-depth reflections. Indicators of in-depth reflections include making specific reference to the learning event, providing examples and elaboration, making connections to other learning, and discussing modifications based on insights from this experience. Developing the Habits of Mind related to continuous growth and improvement requires the capacity to be self-reflective. As students reflect on their learning, they gain important assessment information about how they perceive the efficacy of their thinking. Many of us grow up thinking of mistakes as bad, viewing errors as evidence of fundamental incapacity. This negative thinking pattern can create a self-fulfilling prophecy, which undermines the learning process. To maximize our learning it is essential to ask: "How can we get the most from every mistake we make?" Feuerstein, R., Rand, Y., Hoffman, M., & Miller, R. (1980). Instrumental enrichment: An intervention program for cognitive modifiability. Baltimore, MD: University Park Press.